1. Cut the spring onions lengthways into very thin strips then slice the turkey into long pieces. set aside and keep at room temperature. 2. Whisk together the cider vinegar, sugar and mustard in a large bowl. Season, then slowly trickle in the oil in a thin stream, whisking all the time. 3. 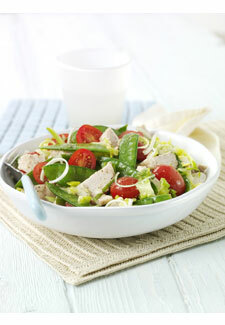 Place the hot turkey, spring onions, lettuce, mangetout, tomatoes and mint in a large bowl, drizzle with the dressing and serve.